The shoulder pads in Alexandre Vauthier’s latest collection are as sharp as Bella Hadid’s cheekbones (she modelled the lookbook, so see for yourself). Maxing out on ’80s drama, the French designer twists this long-sleeved evening gown from gold-toned lamé, knotting it at the centre to create a plunging neckline, nipped-in waist and thigh-high split. For heels? The taller the better, while earrings are best served with sparkle. Alexandre Vauthier can’t resist a little shimmer this season and our wardrobes are jumping for joy as a result. Not the average leather jacket you spy on the tube, this zip-up layer is crafted from lambskin leather and then showered in an iridescent finish that will make mermaids green with envy. 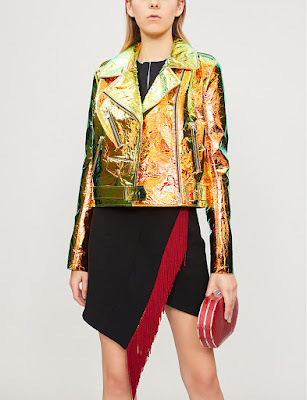 It’s a party piece that much is certain – throw it over a retired little black dress to reap the rewards of something (literally) shiny and new. Alexandre Vauthier designs for a woman who can wear couture as casually as a T-shirt. While we won’t assume you’ll feel the same way shrouded in the lustrous velvet of this gown, the confidence you’ll experience will be unrivalled. Just one daring slit isn’t enough, as the plunging neckline is matched by a leg-exposing part in the skirt caused by a structured wrap panel. They say gold is a match for black – we agree wholeheartedly. Shoulder-padded silhouettes and controlled volume featured heavily on French haute couture designer Alexandre Vauthier’s AW18 runway, as they so often do. 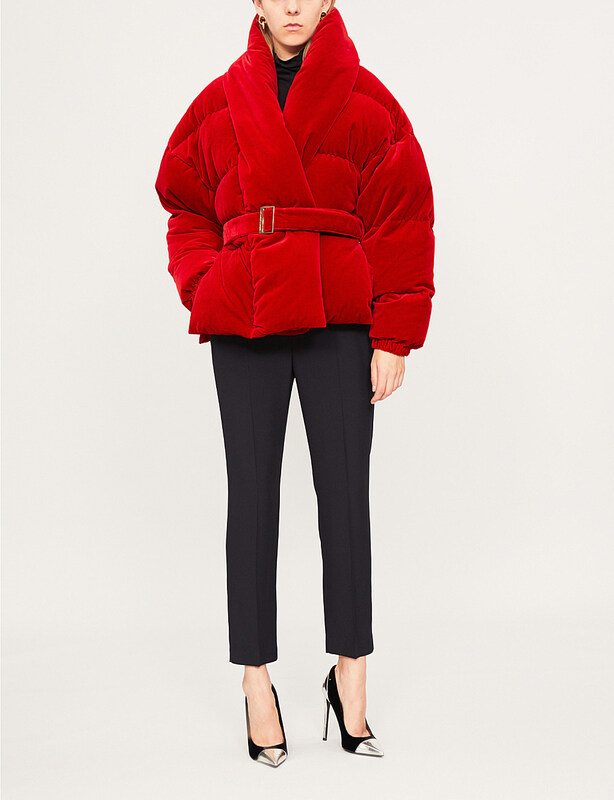 Bucking that trend is this interpretation of the puffer jacket. 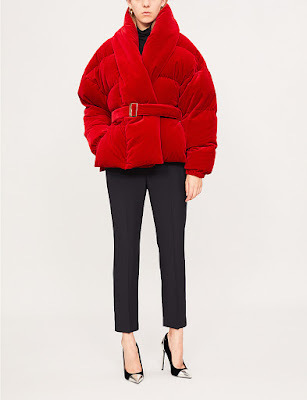 Made from decadent velvet and padded with goose down and feathers, it provides ample warmth in the colder months. We say shrug it over one of the brand’s signature mini dresses and cinch the belt to define your waist. French fashion house Alexandre Vautier juxtaposes modern details with heritage textures to craft its tailoring. 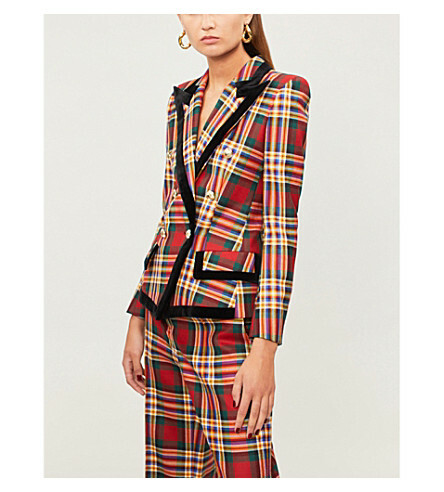 An undeniable investment piece, this jacket is made from plaid-patterned wool with a double-breasted silhouette that’s structured with padded shoulders and framed by contrasting velvet trims. For full effect, style it with the coordinating trousers and a bold red lip. On the haute couture colour wheel, black and gold are a perfect match. They meet in union on Alexandre Vauthier’s MA-1 inspired bomber jacket, forged from two textiles with two completely different personalities. While the main body of this aviator style is rendered in metallic foil that’s perfect for strutting around in like a sartorial peacock on the streets, it’s accented with ribbed trims which keep its silhouette grounded in reality. Alexandre Vauthier echoes the skill of haute couture in every design he creates. And they really are creations. He plays with the marriage of shadow and light with the construction of this velvet dress by interrupting the rich material with semi-sheer mesh. It clings and hugs the curves in all the right places, and balances out the designer’s signature broadened shoulders. As a reprieve from the fabric, a keyhole is slit right between the shoulders. Alexandre Vauthier is changing the way women perceive haute couture by embedding traditional craftsmanship in everyday separates. 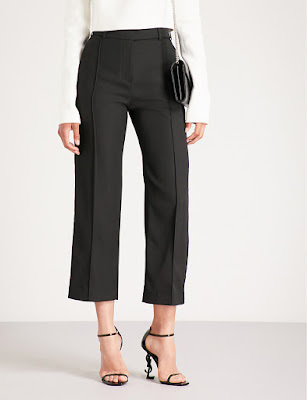 These trousers are artfully tailored in pure wool in a straight cut silhouette that has no interruption. Pressed creases draw the eye from the front, and to the side, velvet tuxedo stripes work to elongate the legs. Put your own spin on a suit and pair these with the designer’s signature strong-shouldered blazer.